Fill a large pot about halfway with hot water (from the tap); cover with a lid and bring to a boil over high heat. 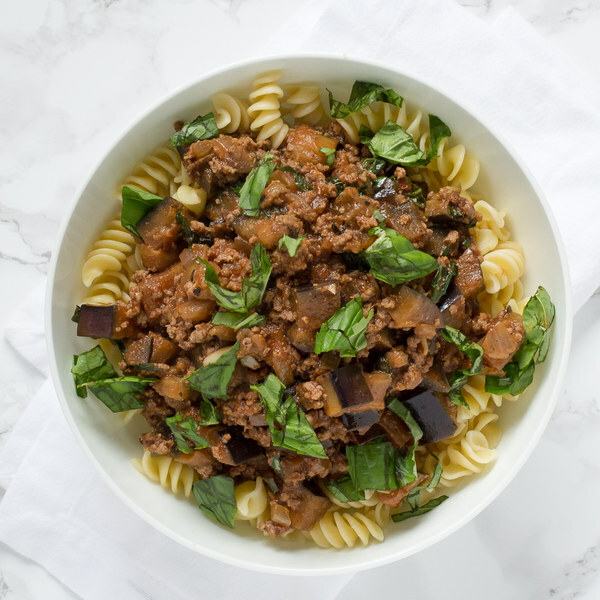 While the skillet heats up, trim off and discard the ends of the eggplants; medium dice the eggplants into ½-inch cubes and transfer to a bowl. When the water in the pot comes to a boil, uncover the pot and season the water with salt, then add the pasta and stir for a few seconds. Cook the pasta, uncovered, for 11 to 12 minutes (or according to package directions). Drain the pasta in a colander, reserving 1 cup of the cooking water.